It is always interesting, when wandering around an exhibition with a critical hat on, to listen in to the conversations around you that are more impulsively reacting to the work. The craggy mountaintops and carcasses of trees that predominate the subject matter of A Dialogue with Nature appear quaint at first glance and, cast a somewhat derivative shadow to the daringly garish daubs and gestures of the Impressionist funnel that leads to this small and, comparatively modest show. Comprising of 26 drawings, watercolours and oil sketches showcasing developments in Romantic landscape work in Britain and Germany between the 1760s and the 1840s, I am at first in ironic agreement with the group of women from a walking club who, are delightfully reminiscing that the pastoral themes evoke memories of ‘that walk we did last year in the Lake District- that was a lovely one’. Yes, indeed, aren’t they ‘lovely’ though? I am willing to hedge my bets that they are referring to the Turners on display rather than Lessing’s graveyard. There is something, however, in the small scale works that keeps my eye wandering within the frames and turns my brisk survey of the terrain into something of a Sunday afternoon ramble. Glancing at the inn which features in Paul Sandby’s ostensibly domesticated view, I almost start to anticipate a jovial watering stop with the walkers. Yet, as the view opens into a panorama, I am drawn away from the inn and into a dwindling distance that has more of the temptation of Robert Frost’s ‘road not taken’ than the comfort of a neatly narrated log fire tale. It is this dwindling detail and sense of something beyond physical and psychological frames of reference that keeps you looking, rather than the settling comfort of pastoral nostalgia. There is another excited gasp behind me yet, this one is emitted by a student- furiously scribbling whilst also whispering to her friend: ‘It’s so unfair we’re never allowed to do things like this at college’. I assume that she is lamenting the lack of landscape painting circulating the Fine Art BA courses yet, the statement also attests to something thoroughly relevant about the works on show that, somehow manage to appeal to our projected fantasies, even as they adhere to that loaded theme of ‘landscape art’. This historically transitive notion in fact places them within a more modern conceit than their (now) classical overtures would suggest. Indeed, it is important to bear in mind that at the time, the landscape embodied a mysterious border space to combat the creeping rise of social industrialisation and cultural European realism. The claim made by Caspar David Friedrich that ‘the artist should not only paint what he sees before him, but also what he sees in himself’, is pre-emptive of a nineteenth and early twentieth century fascination with an untapped inner knowledge dwelling in the unconscious mind- a concept that still resonates with contemporary thought. There is an appeal in the notion of the nominal outsider, working intuitively without regard to a specific audience that runs in tandem with the historic beguilement with exoticism. Self-discovery is approached through contact with the ‘other’ and the artist sacrifices self in pursuit of this intuitive, rather than scientifically grounding, knowledge. For the Romantics, a departure from empirical observation could be a route to this emotional ‘otherness’. This shifts the focus away from a personal-historical identity and rather onto the creation and the objectivity of materials. 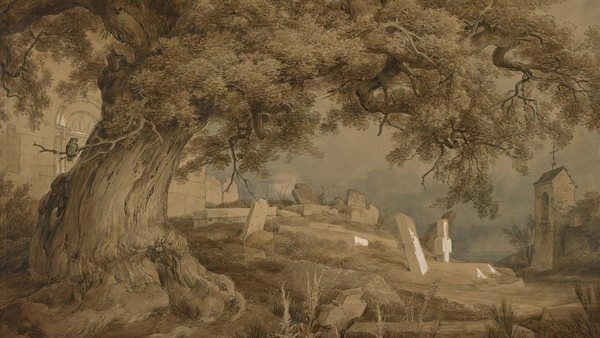 In this light the castles and trees are not undermined by their overt allegory but, rather understood as jumping off points into the imaginative potential of nature itself- an allegory of the other succumbs to the true ‘other’ of a direct sensory engagement with nature. It is in this sense that the exhibition comes into its own curatorially, as individual recognition is placed in lieu of the comparisons and divergences between the German and British schools. This dialogue lends an even sharper focus to the material experimentation that reveals the work to contain the seeds of Impressionism. Indeed, beyond this, the existential conceit of the artist’s mind at the mercy of the vastness and unknowability of nature was one that inspired the reoccurring subject of ‘la foret’ in the work of Surrealist artist Max Ernst that drew on childhood feelings of enchantment and terror induced by his first sight of the forests south of Cologne. The forest hems in the viewer and shuts out the world beyond – much as Samuel Palmer’s disconcertingly visceral tree creates as much as an intense inferno of anthropomorphic energy as the fire depicted in the background. One is reminded of Constable’s cloud paintings in the connecting room whereby, he literally battled with the elements in order to capture the ephemeral nature of space- all references to humanity are dispersed with in order to confront an endless void that is at once vast and intensely introspective. Indeed, the parallels drawn between British and German Romanticism becomes even more pertinent in this context since, this is a struggle embodies the proto-Romantic movement in German Literature ‘Sturm und Drang’ (‘Strom and Strife’), in which individual subjectivity and extremes of emotion were given free reign in reaction to the perceived constraints of rationalism posed by the Enlightenment. For all their initial modesty there is an energetic engagement that unites the small frames of the display. 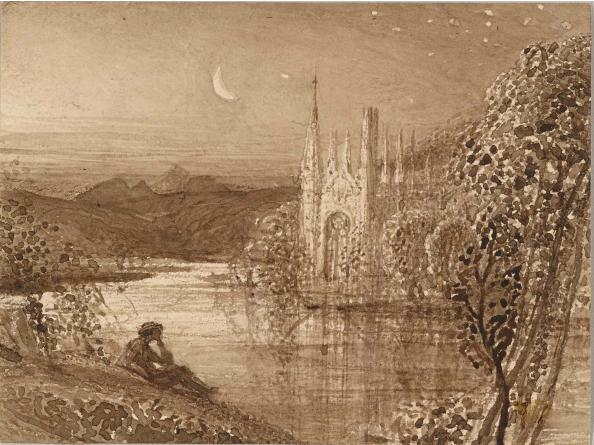 The challenge to capture this reaches its zenith in one of the highlights of the exhibition- The Moonlit landscapes of Friedrich (1808) and Turner (1841). 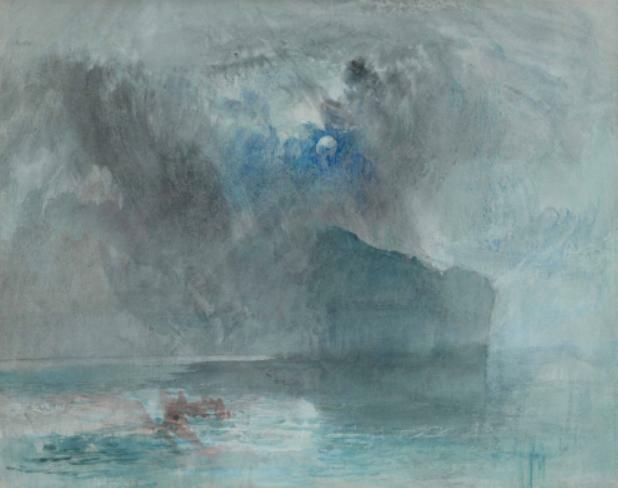 Turner’s veils of grey mist and hints of a vacant mountainscape are devoid of human trace in preference for the sheen of a print like moon which, drags the arcs of light and darkness into abstraction. Land and sky are one and the same, united in a cycle of the psyche’s encounter with space. One is reminded of a Beckett Wasteland. 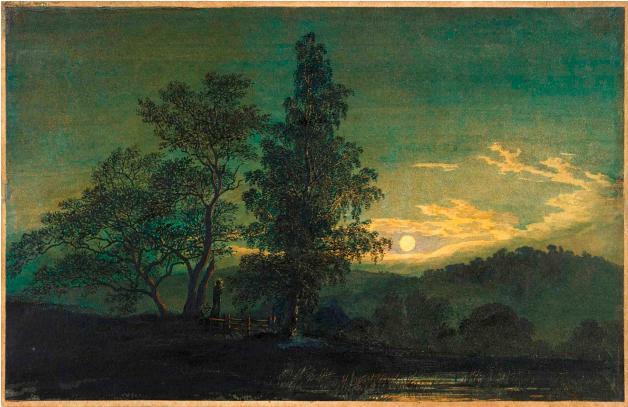 Luminosity is also the key to Friedrich’s lakeside scene which, takes the challenge of depiction of that which is beyond words to new levels. A cut out circle with a white sheet insert stands as a homage to the moon and, the whole painting is in fact a transparency to be illuminate by a candle placed behind it. Even without this faintly occult trick, however, the balance of the inky blackness of the hills and clarity of the lunar sky have all the dichotomy of the ‘Mental Fight’ of Blake’s ‘Dark Satanic Mills’. Cutting, dabbing, dragging are all formal techniques at play between the frames so that a potent energy pervades the modest hues- overstatement it appears is not needed when the substance addressed is already intensely disconcerting – the very real backdrop to a Goethe melodrama.